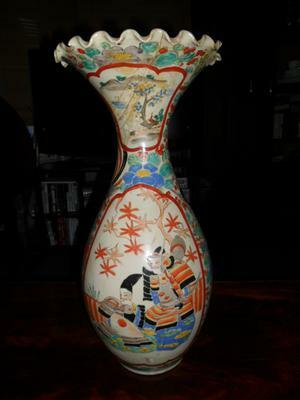 I have very large of Oriental vase. 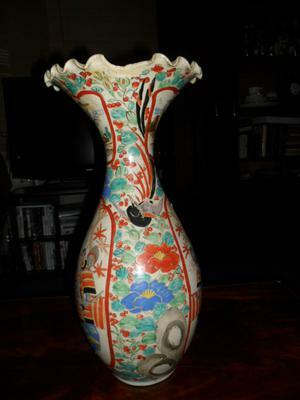 Please help me to identify this vase. Thanks for your comment, I agree it looks like Japanese style as the men on the scene. My one has some flower decoration inside the top. I have no idea about this, my husband got it from local auction. 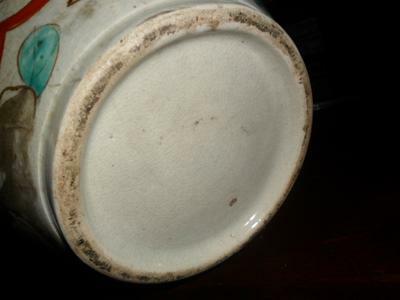 Hi Ping, I have some similar vases, some of the vases I have,have the same mark on the side, Maybe Peter can tell us what the marks mean, I think they might be a kiln mark or the makers mark, the ones I have are marked on the bottom with a six characher mark, made by Fukagawa, on all the early fukagawa vases that I have seen they also decorated the inside top usually with a flower decoration, is yours decorated inside the top rim, the ones that I have do not have a crackle glaze like yours, the crackle was made that way but usually by satsuma and the porcelain by satsuma had a tan color glaze with crackle, the fukagawa did samurai warriors and wemen in bright colors like yours and a ruffed top rim, from Stan. Japanese style, motif/shape and mark. I will leave it to someone specialized on Japanese items to tell whether it was actually made in Japan or in China.